Yesterday, I posted the photo below on all of my social media accounts (see left-hand side of the blog page) of a sauce that I'd made. Over the last few months, I've been cooking from scratch a lot so I thought that I'd share this recipe with you because it tasted so good! This recipe is perfect for chicken or prawns! Coconut oil but any oil can be used instead to fry with, I just prefer coconut oil. 1) Fill half a cup with the liquid honey and add the virgin olive oil and maggi seasoning into the cup. Stir together. 2) Slice the garlic cloves into pieces and press them so as they're nearly like a paste. 3) Slice the chicken and add the coconut oil to a hot pan (I used a wok). When the coconut oil has completely melted add the chicken and garlic. 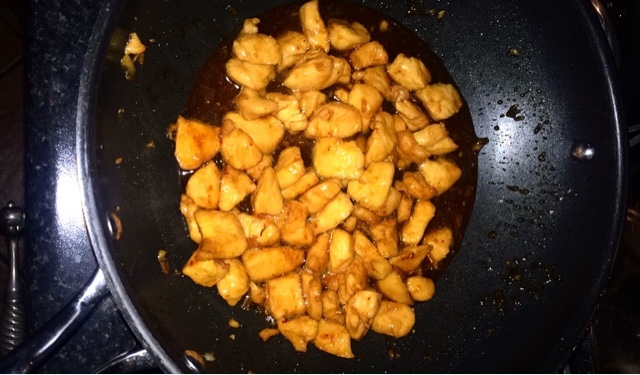 4) As the chicken begins to look cooked add the honey sauce mixture into the pan. 6) Add your desired amount of chilli flakes, this gives it a kick. I used loads because I love spice! Is Love Hard To Find Or Are You Just Afraid?